Here is the college area pizzeria you have been waiting for. This is a golden opportunity to get in to a college area restaurant cheap! This San Diego pizza restaurant has been in business for 10 years at this location. Located on a super busy street just off Montezuma road, which everyone knows is the home of the SDSU Aztecs and all those pizza and beer-craving students! Seller is looking to retire and is practically giving this restaurant away. The goodwill he has built up, the location he has built out and the proximity to the largest college in San Diego, it's turnkey and it’s all here, ready for you to take advantage of. Keep the current concept or convert to your own, with LL approval, the choice is yours. Easily convert to a sports bar with the restaurant on one side and the bar on the other. There is a pass through window from the kitchen to the bar area allowing for easy access and increased efficiency. Seller states gross yearly sales have been in the 300k range for the past three years. With some marketing, a little clean up, and some new energy, this place would be filled with customers and ready for substantial increases in sales and profits. You can’t beat the area if you are looking for pizza and sports bar type demographics. Apartments, dorms and the frat houses are all nearby, there is even a brand new set of apartments/mini dorms just across the street that have just finished construction and are now leasing to even more of your customer base. 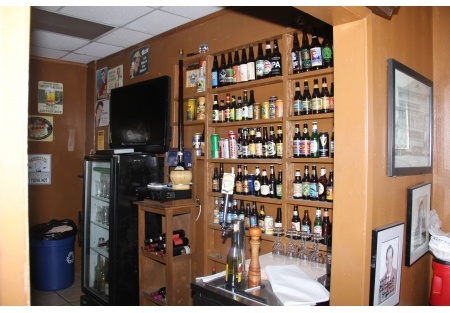 Restaurant space is approximately 2300 square feet with total monthly rent of $3700. Current lease term expires in September of 2017 with lease stating that options to extend will be available. Don't miss this college area opportunity!